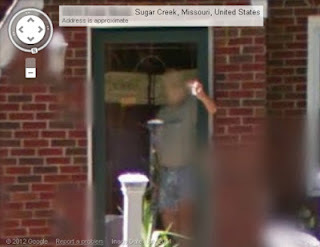 I probably have 50 to 100 or more pictures of Professor Ulichne doing this, but my all-time favorite is the one I found when I looked up his address the day I found out Google had updated their Street View pics. The professor, a decorated Marine Corps veteran of the Vietnam war, called it "ambushing Google." When he saw the car with the camera on top turning on to his street, he knew exactly what to do. That's hilarious! Oh, and by the way, he has way too much time on his hands. LOL!